It blows my mind that I’ve known The Cherry Bluestorms since the International Pop Overthrow Festival of 2013. I’ve stayed in touch ever since the first time I saw them at the Sail Inn and reviewed their full length record Bad Penny Opera when they returned to Tempe for a set at Long Wong’s during Fairy Bones FBOM at Long Wong’s. How is that for a ton of local music scene history and oft-forgotten lore? They are currently working on completing their third album, which I am eagerly anticipating, because their classicist sense of psychedelic pop and rock drawn from the definitive influences of the era makes my soul swoon and my brain tingle. They harken back to the mid to late 1960s in no uncertain terms and absolutely by design, right down to their entire look and dress–each of their albums has included a cover from that era as well. This is definitely my bailiwick and I proved this years ago by writing about them as the first band that is not local to get a full feature here. 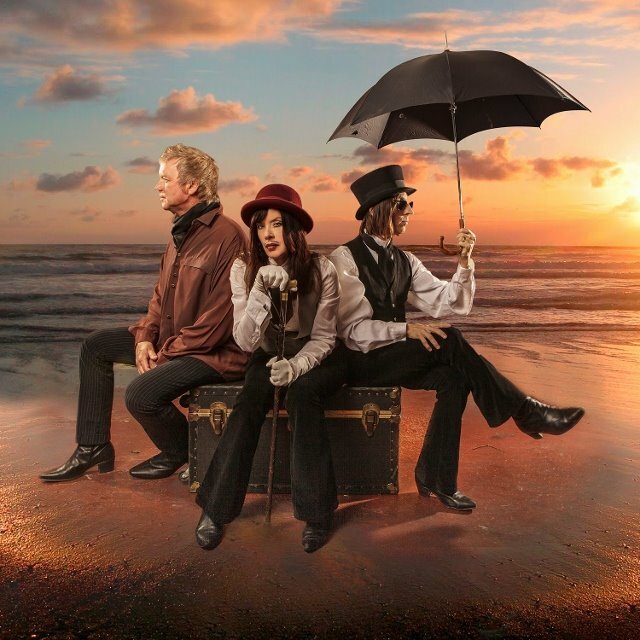 The Cherry Bluestorms are from Los Angeles and they consist of three musical vets who produce a set of song out of a labor of love for the sound itself. Deborah Gee is the leading chanteuse, Glenn Laughlin (The Dickies) is the multi-instrumental genius behind guitar, vocals, bass and keyboards and Mark Francis White (The Furys) is the drummer. Together they are The Cherry Bluestorms. The first hint of the new album is the single “See No Evil” b/w “Dear Prudence”, I can’t guarantee that will be the cover that pops on the new album, but it’s probably a good bet. “See No Evil” has this great Mod jazz groove that sounds like they’ve been listening to deeper cuts from ’60s pop and soul records–like the kind of swing Paul Weller got into right before launching Style Council, but with Deborah Gee on vocals. It’s a fantastically refreshing single, because not a lot of people are making music that sounds so authentically pulled out of the time. They sound like The Cherry Bluestorms, but like The Cherry Bluestorms recorded at Muscle Shoals fifty years ago. It’s got a psychedelic finale that will blow your mind quite rightly, while everything before that is four minutes of perfect pop majesty. Seriously, it’s not hard to imagine young women in Twiggy haircuts rocking pop art minidresses dancing the night away with sharp lads in smart outfits and shades. This is the kind of thing the Scooter Boys would have been all about. Their cover of The Beatles “Dear Prudence” takes a dark, flanged approach to the tone with Laughlin surprisingly taking the lead vocals, but it works perfectly within the framework of their remapped construction. It’s possible they’ve made it more psychedelic than the original somehow, while also heavier and more wistful. It’s an interesting rearrangement of familiar architecture and a great stepping stone straight into a dream. You can check out “See No Evil” below, but if you want to hear “Dear Prudence” you’re going to have to go to the show. You can catch the Cherry Bluestorms at the Lost Leaf on Friday, April 21st, where they will be playing two 45 minute sets and will play the following evening in Bisbee at The Quarry, in case you’re headed down there for the festivities. I would highly recommend you get your groove on at one of their sets this weekend while you can!